An elegant cube in clear glass decorated with a silvered ring and topped by it's bouquet of black sticks for a contemporary design. Created in an engineered polymer, with 8 sticks guarantee an optimal diffusion of the fragrance without discolouration in the solution. The polymer sticks allow a quick infusion and diffusion of the fragranced solution vs Rattan reeds with a much better olfactive restitution. Time of diffusion: +/- 4 weeks of use (depending on the fragrance, between 4 to 10 weeks). 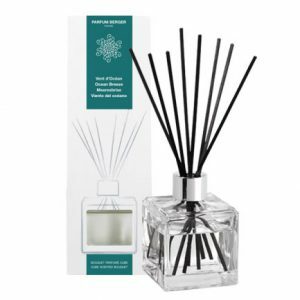 Refillable by purchasing a 200ml "refill" fragrance.